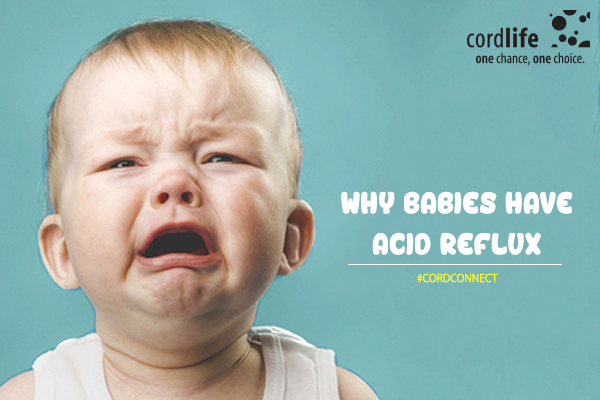 Home > Cord Connect > Cordlife India > Why Babies Have Acid Reflux? You may have heard of GERD or gastro-esophageal reflux in adults. Have you heard of reflux in babies? Well, about half of all babies who come under 3 months of age have reflux. Let us see why babies have acid reflux in this article. What is Baby Acid Reflux? Baby GERD or baby acid reflux is the bout of spit-up or regurgitation of food (milk) swallowed into the stomach back into the food pipe (esophagus). At times, the food goes back into the stomach or mostly is vomited back. Babies tend to spit up after almost every feed. It happens when milk and acid are pushed back into the gullet or the mouth. Why Do Babies Experience Acid Reflux? Acid reflux in babies occurs as their digestive systems are immature. When food is swallowed, the esophagus automatically contracts and pushes the food down into the stomach. A valve, called the lower esophageal sphincter (LES) relaxes and lets the food pass through. The LES prevents the food and acids from going back up into the esophagus. However, in GERD, the valve does not close properly or remains open. Thus, allowing backflow of stomach acids and food into the esophagus. In babies, the reflux occurs as the LES valve is weak and may not close properly. Secondly, babies tend to lie down most often and their esophagus is shorter than a grown adult. Thus, babies spit up or burp after every feed. This is usually not painful and quite normal in babies under 1 year of age. At times, the milk may get mixed with stomach acids and come up. 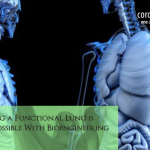 This irritates the inner lining of the esophagus causing pain and restlessness in the baby. Reflux is not bad for babies as it helps reduce the pressure in case the baby has swallowed more milk and overcome the stomach discomfort. What Are the Signs of Baby Acid Reflux? Generally, babies do not show any symptoms of acid reflux. They just tend to spill milk after a feed. However, when acid is mixed up with the milk regurgitated, it may cause certain symptoms. When the baby who spits up after feeding that may spoil their clothes, and even yours, yet do not seem to be affected by it, means it is a normal regurgitation. However, if it bothers the baby and leads to pain, discomfort, and cry during or after feeds. Their vomiting is more significant after feeds. A few babies may vomit more than they feed and tend to lose weight or are unable to gain weight. At times, these symptoms may go beyond acid reflux. 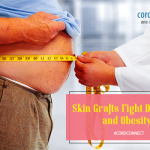 They may be suffering from lactose intolerance, stomach infections, or gastrointestinal disorders. 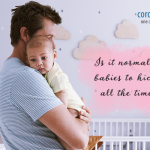 A few babies also suffer from silent reflux that does not cause any visible symptoms. Such babies may cry a lot and appear to be in pain with a persistent cough. However, they may seem a little relaxed when held upright. How to Treat Baby Acid Reflux? Baby acid reflux is not a condition that requires treatment normally. It usually goes away on its own as the baby grows. However, if it seems bothersome to the baby, then you may try changing the brand of milk for formula fed babies, or the mom need to tweak their own diet for a breastfed baby. Give the baby frequent small feeds, so that the stomach does not get too full. Hold the baby upright at least for half an hour after a feed to allow the milk to go down into the stomach. Allow quiet time after feeds so that the milk gets digested and does not lead to discomfort and gas. When it comes to baby acid reflux, all you can do is help your baby get comfortable and burp it all out. If it seems bothersome and worrisome to you, speak to your baby’s pediatrician for further advice. Is it normal for babies to hiccup all the time?